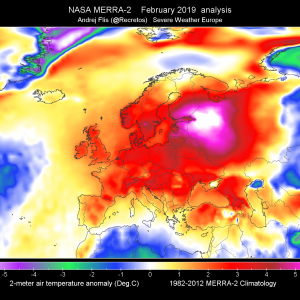 A large upper low over Balkan peninsula moves further SE towards the Black sea as upper ridge streghtens from western into central and SW Europe. 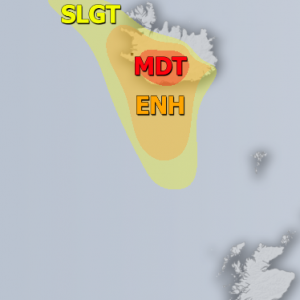 A deep cyclone moves from E Iceland towards central Norway. ENH/SLGT risks have been issued for Norwergian sea into coastal W Norway with threat for mainly non-convective severe winds, locally in excess of 120 km/h. Some convectively enhanced gusts are possible as well. 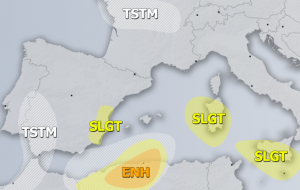 ENH/SLGT risks have been issued for extreme NW Spain into the Bay of Biscay with threat for non-convective wind gusts, locally in excess of 100 km/h. 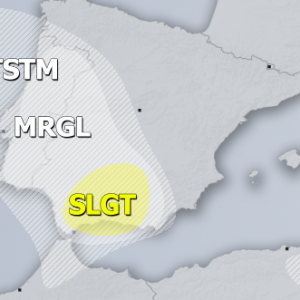 A SLGT risk has been issued for extreme SW Mediterranean into Strait of Gibraltar for non-convective severe wind gusts, locally in excess of 100 km/h. 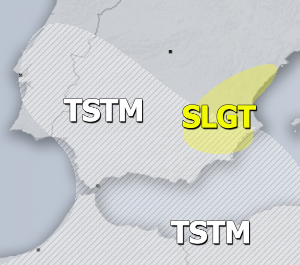 A SLGT risk has been issued for NW Turkey with threat for severe storms, capable of producing severe winds, large hail and torrential rainfall. 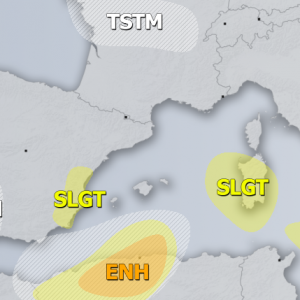 A MRGL risk has been issued for NNW Turkey, surrounding the SLGT risk, where some isolated severe storms are possible with threat for marginally large hail, heavy rainfall and severe winds. 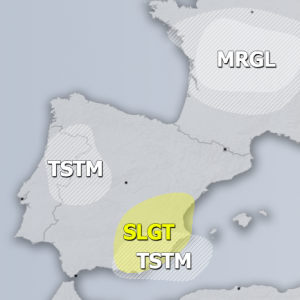 TSTM areas have been issued for Corsica and Sardinia, W Iberia and S Balkan peninsula where some storms are expected, but should remain sub-severe. 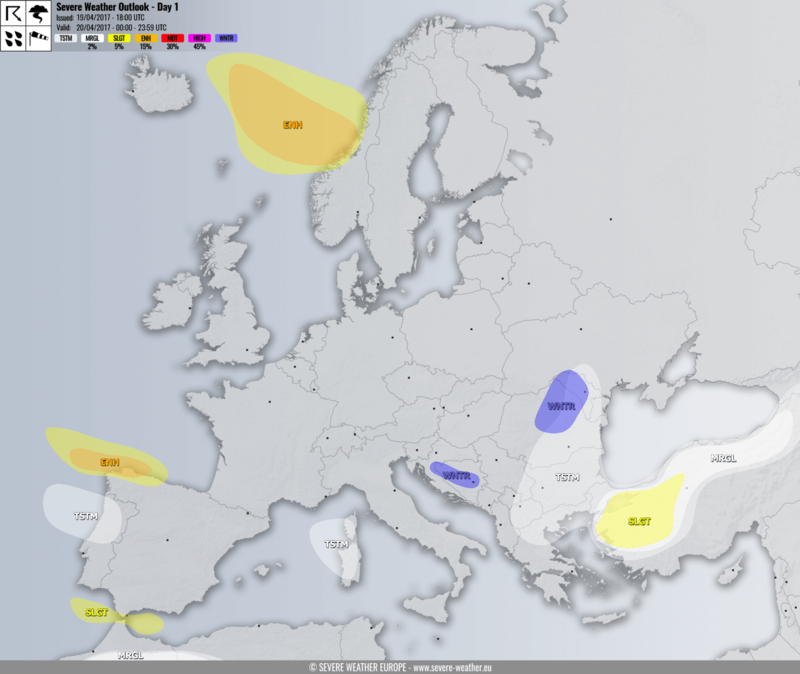 A WNTR risk has been issued for part of Bosnia and Herzegovina with threat for excessive snowfall, locally fresh 25-40cm of snow seem likely due to strong NE flow resulting in orographic lift onto Dynaric Alps. A WNTR risk has been issued for ENE Romania into N Moldova with threat for excessive snowfall, higher mountainous areas (Eastern Carpathian Mountains) should locally receive up to 50cm fresh snow.